Currently in Belarus, more than ten clubs with a combined total of over 500 people are engaged in the themes of World War II. Each club has its own specialty: the Wehrmacht or the Red Army, various battalions, regiments, divisions and so on. 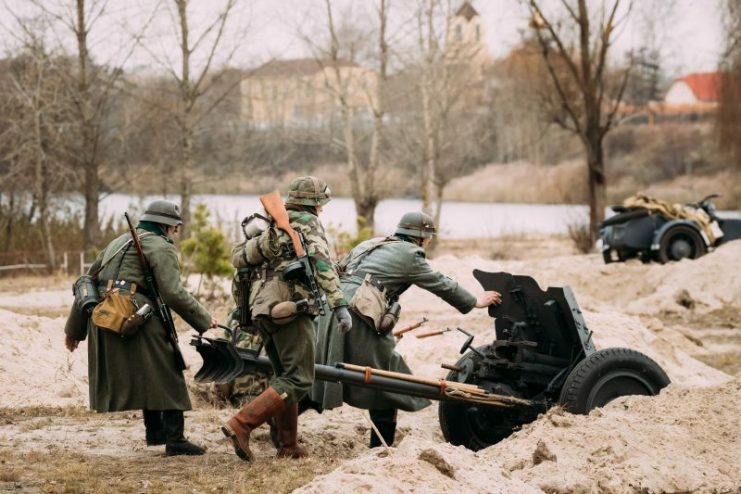 For people involved in the reenactment of World War II battles, this is often not just a hobby. Reenacting is serious work that requires careful research, study of crafts and restorations, regular training, campaigning with the younger generation and veterans, speaking to the public, shooting in movie episodes, and much more. Gomel, Belarus. 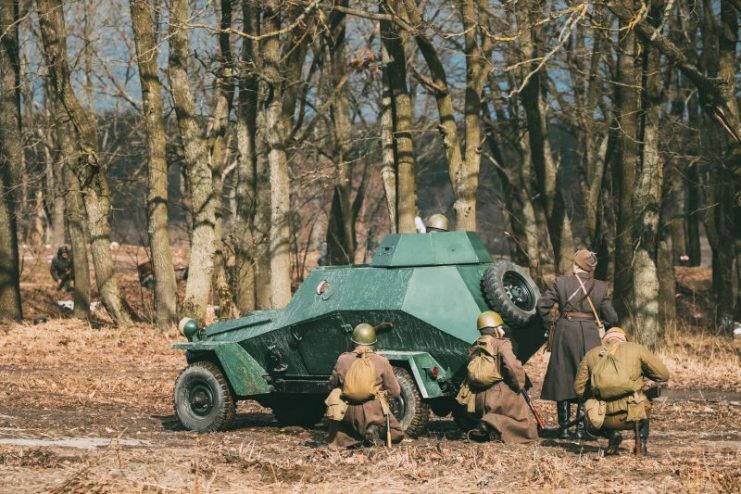 Group Of Reenactors Dressed As Russian Soviet Red Army Soldiers Of World War II Go On Offensive Under Cover Of Armored Soviet Scout Car Ba-64. 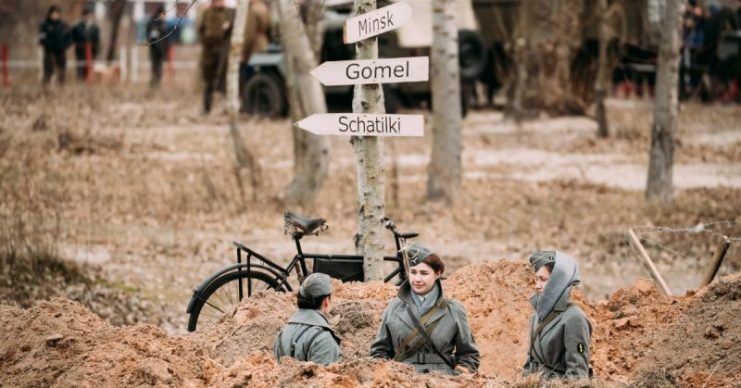 In this territory of the former Soviet Union, military history reenactment began in the early 1990s. The first to appear in Belarus were “knight clubs” formed by enthusiasts fascinated by the era of Napoleon. After that, other clubs began to appear that reenacted the events of WWII, called the Great Patriotic War in the USSR. 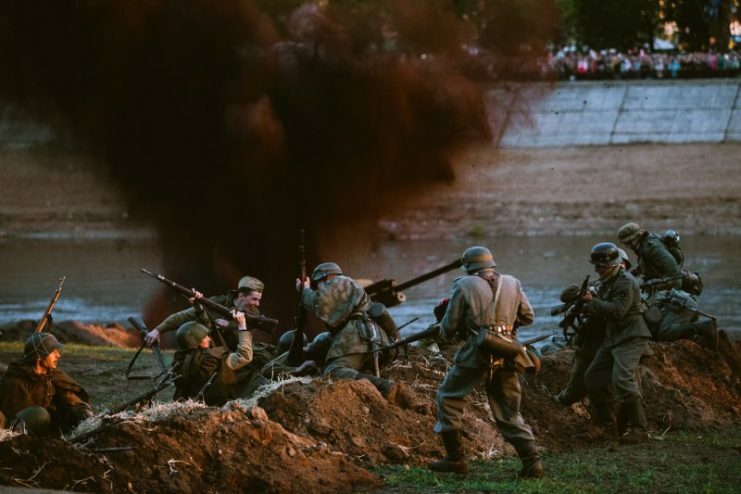 Re-enactors Dressed As German Wehrmacht Infantry Soldiers And Russian Soviet Soldiers World War II Play A Scene About Fighting In Trenches. 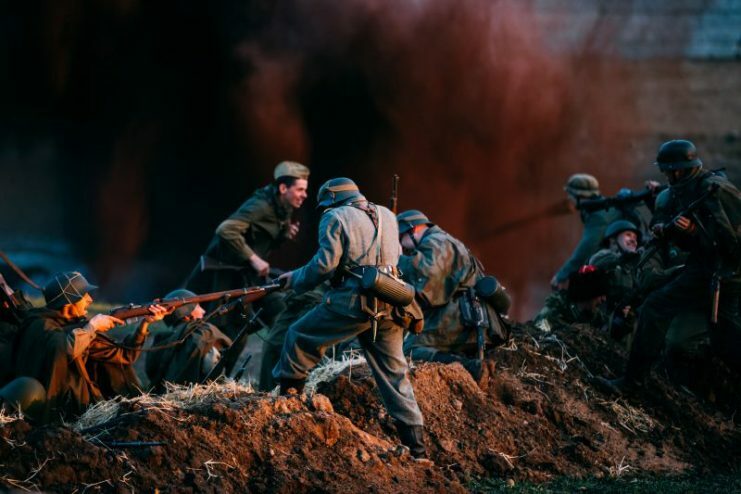 Group of Russian Soviet Armed soldiers, re-enactors during reenactment of World War II battle. 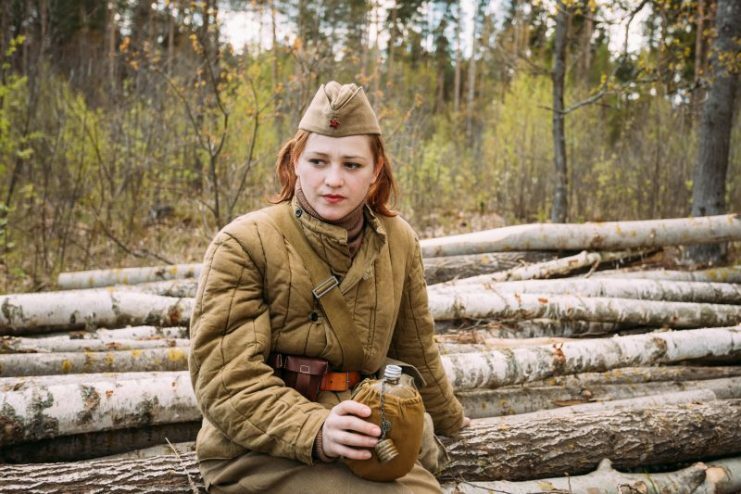 A complete replica uniform of a Red Army soldier in Belarus costs about 500-1,000 dollars. The basic set of a German soldier costs on average from 1,000-2,000 dollars. Each participant orders himself a uniform tailored to his body measurements. Before the start of the reenactment event, the appearance of the participants is inspected. If the uniform does not fit properly or has historical inaccuracies, then the participant may not be allowed to participate. 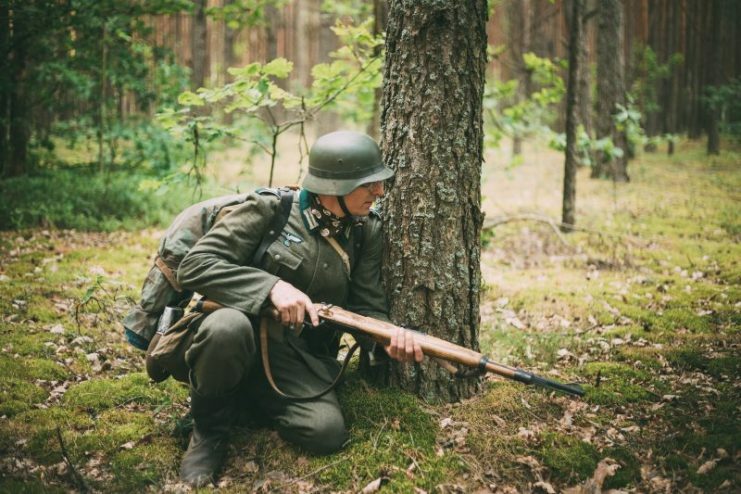 Svetlagorsk, Belarus – June 20, 2014: Unidentified re-enactor dressed as German soldier aiming a rifle in forest during events dedicated to 70th anniversary of Soviet offensive operation ‘Bagration’. First of all, we are engaged in living history. In books, especially in the books of [government] cabinet scientists, there are many inaccuracies and errors. Nobody writes how a man in a day begins to break his back from the severity of a bulletproof vest, what are explosions and concussion. When you feel all this on yourself, you understand what it was like for soldiers in the 1940s. Moreover, military operations occupied only 10% of wartime, the remaining 90% of harsh everyday life consisted of exhausting walking, a crazy load on the psyche. 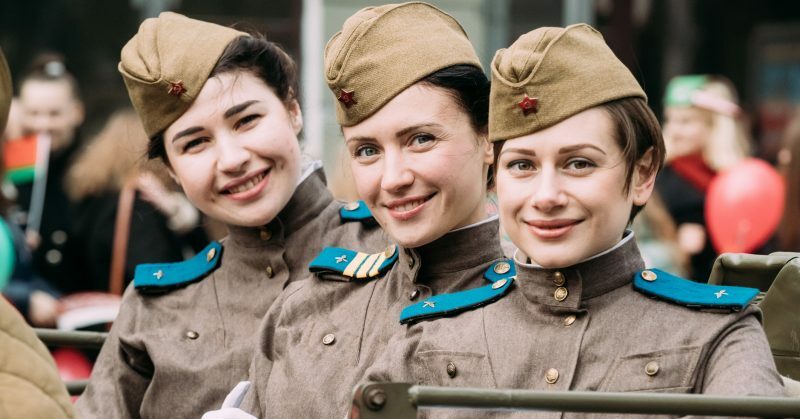 Many women are among the Belarusian re-enactors of WWII. They are engaged in recreating the life of military doctors, nurses, staff personnel and telecom operators. Any interested person who is a legal adult can become a member of a club. When they first join a club, the future re-enactors choose one of the opposing sides. However, there are frequent cases when club members have experience and the necessary equipment to be on the side of either Nazi Germany or the Red Army. In addition, in the reenactments, all attempts to propagate Communism, Nazism or other radical ideas of the WWII era are suppressed. There is no place for politics, only for military history. 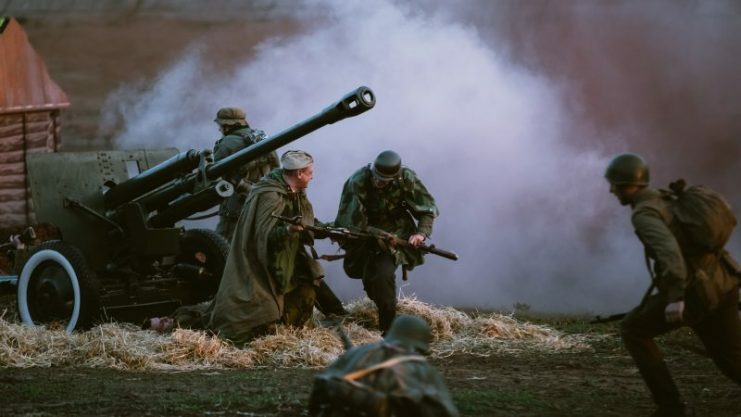 Early on in Belarus, only legal entities could rent weapons for reenactments. However, in modern times, legislation allows re-enactors to have their own gun, firing blank cartridges. Some of the participants use mock-ups made from original weapons that were bought in neighboring countries. Original military equipment is very rarely used for reenactments because the armored vehicles of those years are hard to find and miserable to use. For this reason, replicas of military equipment from the Second World War are most often used. Belarus: Reconstruction of Battle during events dedicated to 70th anniversary of the Victory of the Soviet people in the Great Patriotic War. 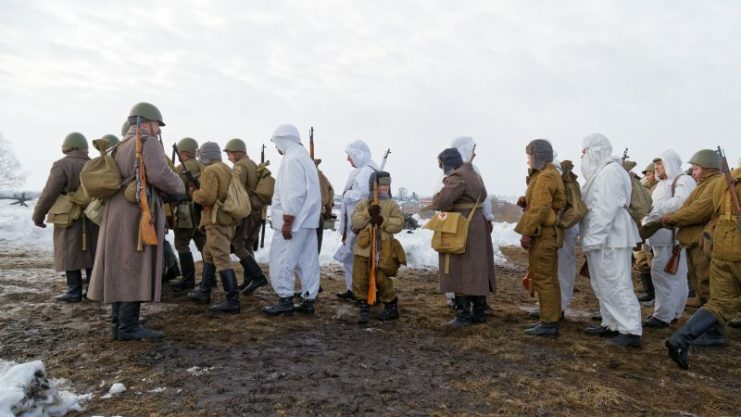 In Belarus, the main site for reenactments is the Stalin Line. It is located near the city of Minsk and was created around the restored structures of the Minsk fortified area. 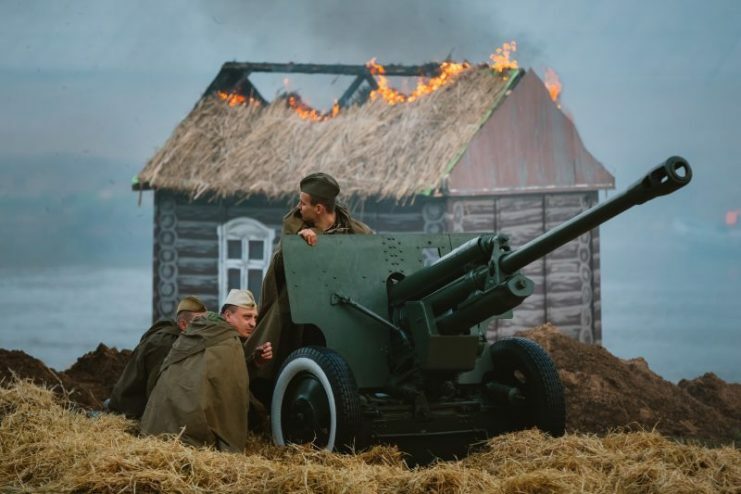 Reenactments of other battles of the Great Patriotic War are also held near Polotsk, Gomel and Mogilev. Abandoned buildings are used to recreate the fighting. 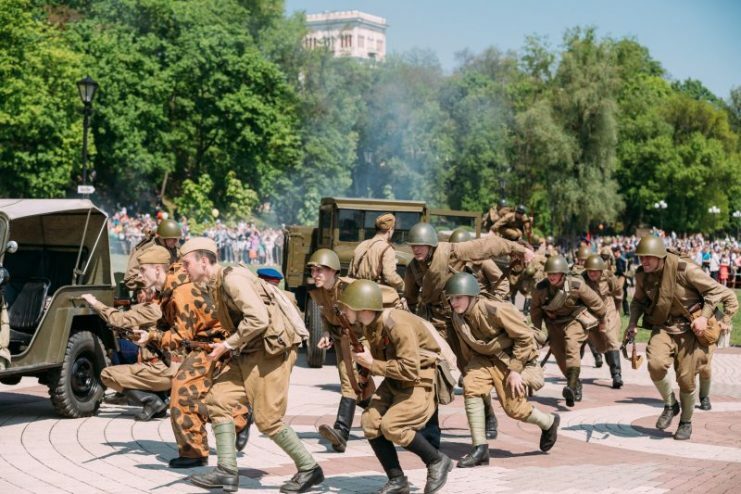 Mogilev, Belarus – May 8, 2015: Reconstruction of Battle during events dedicated to 70th anniversary of the Victory of the Soviet people in the Great Patriotic War. Before the battle, participants discuss the details of the battle, for example, who will be killed and who will survive. However, despite the prearranged scenario and security measures during the reenactment, injuries often occur. Many of the participants say that they are ready to feel all the hardships of the war their ancestors suffered. One of the main aspects that re-enactors celebrate is the unification of history lovers. In real life, many of the re-enactors are of different social positions, ages, and religions. However, coming to the battlefield, they forget about everyday differences and become a single team with a single goal–recreating the struggles of the past. Each re-enactor considers it his duty to remember the history of his country and to share it with other people.